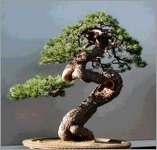 The Mugo pine, Pinus mugo pumilio or Dwarf mugo pine is an excellent bonsai subject. This tree occurs throughout the Midwest, West and ranging to Canada and Alaska. In nature it is a medium-sized tree that can reach a height of 2-3 feet tall and spread over 5-6 feet. It is a favorite of bonsai hobbyists because of its rapidly thickening and naturally twisted trunk and branches. The bark is thin, ash-grey-brown to blackish-grey, splitting in angular scaly plates on old stems. The branching is very compact, making it easy to maintain. Pinus mugo pumilio is small and has branches that are more erect than Pinus mugo mughus. Short-needled tree with open, broad, irregular crown of long spreading branches. This evergreen little dwarf conifer has branching, upright stems evenly covered in 1 1/2 - 3" long needles, 2 in bundle; slightly flattened and twisted; of a deep, dark true green.